To make this work for both you and the community, take the job seriously. That means arriving on time and attending all meetings. If you must miss a meeting, let the staff and commission chair know as far in advance of the meeting as possible. This is particularly important when there are citizen requests on the agenda and a quorum of members must be present to take action. 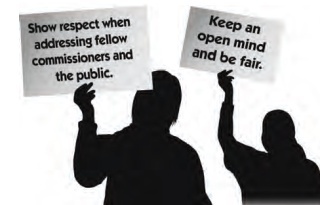 Show respect when addressing fellow commissioners ("Commissioner Johnson"), the audience ("Ms. Smith" or "Mr. Olson"), and Chairman ("Chairman Nelson"). Always address the chair before speaking. When speaking to staff, show that same respect. Don't assume that the staff is always wrong and the citizen is always right (and don't assume the converse, either). Planning cases are not a matter of who is wrong and who is right. It is more important to make decisions based on the best information available and be fair. Agree or disagree in a respectful manner. You can expect applicants, as well as those opposing an application, to often be emotional. 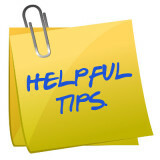 Their request or opinion is very important to them, especially when it involves their property or neighborhood. You need to control your emotions in response. When someone is emotional, repeat or summarize what was said. Narrow down the issues. 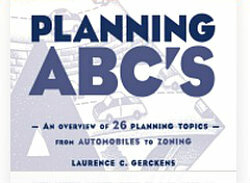 Focus on issues that the planning commission can address. Don't promise anything and don't try to answer questions without having the information at hand. Realize that you can't please everyone -- nor should you be trying to. Don't do things to disrupt the meeting. Don't have side discussions with the person next to you. Don't make personal attacks, faces, whisper, or exhibit body language that show displeasure. All of these behaviors can reflect badly on the commission and the community. Remember that most commissions represent a variety of views. As such, decisions may not always be unanimous. That's okay. Don't feel you have to compromise. Sometimes the commission can broker a win-win situation for everyone, but compromise is not always the right answer. The most important part in making a good decision is to keep an open mind and be fair. Decisions will be upheld if you work through them using due process. Applicants are entitled to a fair hearing. You need, at the start of a hearing, to declare any potential conflicts of interest, even if it is only a perceived conflict. This generally means recusing yourself from participating in the hearing and deliberation on that application. During hearings on an application it is essential that commissioners listen to the evidence, weigh it carefully, and give everyone a reasonable opportunity to be heard. Remember, your decisions will not be upheld if they are unreasonable, arbitrary, or capricious. Decisions must be made on factual evidence and based on what your code or ordinance does or does not allow. Be careful in the weight you give to petitions submitted to you in support or opposition to a project. There is often no way to know what information was given to signers to encourage them to sign the petition. Likewise, do not be unduly swayed by a show of hands in the audience (and certainly, don't ask to see a show of hands!) Again, your job is to be guided by the criteria in your regulations, not by popular opinion. Resist the temptation to redesign the applicant's request. Your job is to review and identify concerns; it is the applicant's job to design the site to meet the requirements of your zoning or land development regulations. If you need more information, ask for it and don't feel compelled to make an immediate decision. On the other hand, don't unreasonably delay a decision simply because it is going to be a difficult one to make. Review proposals based on their merits, not simply on what the developer states is best in order to make a profit. 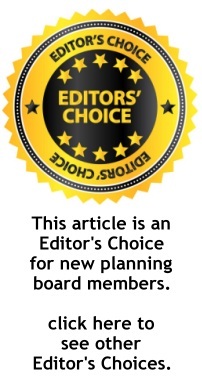 In many states, the planning commission is not the final decision-maker on development applications (and in almost all states, does not have final say on rezoning requests), Instead, planning commissions are typically charged with providing a recommended decision to the governing body. While governing bodies usually give weight to the commission's recommendation, don't be offended if they do not accept or follow your position. Your ultimate goal is to make the best decision possible -- based on clear, solid findings of fact, in conformance with your adopted regulations -- and doing so in a manner that allows you to maintain the respect of the community.